In 1809 the dispossessed Friedrich Wilhelm of Brunswick, consumed by his desire for revenge against Napoleon, entered into an agreement with the Austrians to raise a new corps of infantry and cavalry. As a physical expression of this vengeance he decided to clothe his new troops all in black and adopted as his badge the skull and crossbones, resulting in his corps' christening as Die Schwarze Schar (the Black Horde). 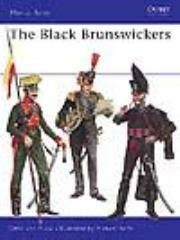 This book details the pivotal role that the Black Brunswickers played in major battles of the Napoleonic Wars, including Quatre Bras and Waterloo, and outlines the organization, uniforms and equipment of these formidable troops.